Update: The Radion has been updated to a generation 2 model and a Pro model. Here’s my review of both of the new lights. After much researching and deliberating, I’m testing out the EcoTech Marine Radion LED fixture as a possible LED setup for my SPS-heavy 90g tank. This page will serve as a homepage for the Radion LED experiment and any updates about it will be posted here. Note: There is an error in the show. The royal blue LEDs are 460 nm in wavelength and the blues are 475 nm. YouTube doesn’t allow me to upload a new version of the show on the same link so I’m leaving the show as is with the above note. Third, I am a dealer for EcoTech Marine (even for you Canadians out there) so if you are interested in pre-ordering a Radion (they’ll ship about Sept 30th), please let me know. People have been asking me to post a picture of my tank lit up with both the 250W Halide and the Radion. Below is that picture. Halide is on the left of the photo, Radion on the right. Something that I’ve always found interesting is how white my 20K reefluxes look. To me, they look more 14K than the traditional 20K which is known for being heavily blue. Certainly when I have the Radion on a 20K spectrum, the Radion’s 20K light is far bluer than the Reeflux 20K. After 2 weeks with the Radion, I have seen no bleaching whatsoever with the corals underneath it, so I’ve upped the hours it runs per day from 4 to 5. I’m also running the fixture @ 100% on all LEDs. I’ll admit it would probably have been safer to ramp up the power of the Radion, but since the Radion is a 250W metal halide replacement, and my corals were used to a 250@ halide, I felt safe running the Radion @ 100% and simply increasing the time it was on. Plus I’m impatient. So far, so good. My corals continue to look great so I’ve increased the time the Radion is on to 6 full hours. There is lots of chatter about red LEDs growing algae and I’ve seen no algae growth under the Radion. Just about 1 month into the experiment, all my corals look great and I’ve increased the time the Radion is on to 7 hours. My full photo period will be 7.5 hrs. At this point, I’m very tempted to get rid of the halide on the other side of my tank and replace it with a Radion. However, patient is a virtue so I’m holding off…for now. I also want to make sure this experiment gets ample time to run before I make a final decision. I’m close to 2 months into the Radion experiment and things are going very smoothly. The Radion has been running at full strength (100% on all channels, 100% intensity) for just about a month and my corals look great – no bleaching, no noticeable slowing in growth. Growth patterns remain the same as under halides as well. Good news all the way around and it makes me eager to make my tank 100% Radion LEDs. – How does the shimmer compare to your metal halide lamps? – How far off the water do you have the Radion? – How is the spread? Excellent. I think 1 Radion per 2’x2′ area is fine. If you want crazy PAR readings like a 400W Halide, use 2 per 2’x’2 area. I also like how the Radion has very minimal spot lighting effect which means my tank doesn’t look like an interrogation room. – How are you acclimating your corals? Since the Radion has about 10% better PAR numbers than my 250W halide lamp, I’m ran the Radion @ 100% for 4 hrs, then added an hour per week until I reach my full photoperiod of 7.5 hrs. NOTE: If you are switching from lower intensity lighting like power compacts or low wattage T5’s or Metal Halides, it won’t hurt to run the Radion at a 50% intensity setting for a short time, then work your way up t0 100% on the short time setting. 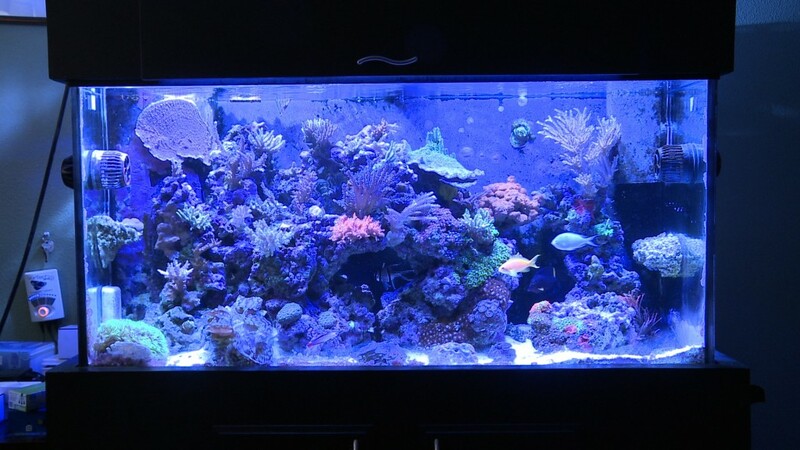 Once your corals are ok with the new intense light, increase the time the Radion in on. Remember, slow is better. – How much do the Radions cost? EcoTech Marine has a minimum advertised price (MAP) policy which stipulates the price for the Radion cannot be below $749. In keeping with EcoTech’s policy, I’m selling the Radions for $749 shipped to the continental USA. After 4 months of testing the Radion out, it is time for a full update.